Asbestos contaminated land, soil, construction and demolition (C & D) material what do we offer? Below are answers to some of the most frequently asked questions about asbestos contaminated land. Can’t find what you’re looking for? ‘Contact us’ and we’ll be happy to help. What is Asbestos contaminated / land, soil, C & D material? Any land, soil or material from construction & demolition on that land that contains any level of asbestos is considered to be asbestos contaminated land. Asbestos contamination generally occurs on brownfield sites only. However greenfield sites can sometimes be contaminated due to illegal tipping of asbestos or asbestos contaminated materials. What is a brownfield or a greenfield site? A greenfield site is a piece of land which has never been built upon. A brownfield site is land which has previously been used and built upon. Why do brownfield sites cause so many problems with asbestos contamination? Generally, brownfield sites have had buildings demolished in the past or have buildings currently requiring demolition. 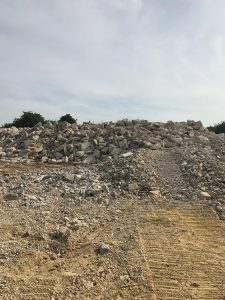 Due to historical poor practices it is common place on most brownfield sites to discover asbestos contamination within the soil when demolition has been completed. This asbestos contamination is generally overlooked at planning stage and can cause significant time delays for a project. The asbestos contamination is usually discovered during ground works at the site. This then can cause delays whilst surveying, testing and remedial works are put into place. Additionally, when taking soil from a brownfield site for reuse or disposal it is a legal requirement to have WAC testing (Waste Acceptance Criteria) undertaken. What is WAC (Waste Acceptance Criteria) testing? WAC testing is used to determine how soil will behave if buried at landfill. WAC testing determines the potential content of contamination within the soil and this includes asbestos. There are generally 3 stages of WAC testing that are used when it comes to asbestos. These 3 stages give you the information that you need to know how to deal with the asbestos contamination. Stage 3: Fibre counting. Stage 3 is usually carried out if the % of asbestos in the above stages is less than 0.1% or if the soil sample contains unbounded (loose) asbestos fibres. Remediation or clean of asbestos contaminated land, soil or C & D material. Asbestos land remediation can be very complex. We have extensive experience in all types of asbestos remediation and cleaning of soil / material contaminated with asbestos. This ranges from non-licensed products such as asbestos cement all the way through to licensed materials such as asbestos insulation and asbestos boarding. Removing asbestos from soil is a lengthy and difficult process. The bigger the site the more complicated the remediation can be. The first type of remediation to be considered id the physical removal of asbestos material fragments from the soil. This is known as “picking”. This is a tried and tested method prior to soil going for reuse or to landfill. However, if the asbestos contamination is not in a solid state then this method cannot be utilised. Where loose fibre is present throughout sometimes the only way to remediate the site is for the soil to be disposed of as asbestos contaminated waste. “Asbestos Waste is ‘Hazardous Waste’ when it contains more than 0.1% asbestos content” . The only way to confirm this percentage is to undertake WAC testing of the soil. This testing can potentially save the client £1000’s in waste disposal costs if it falls below this threshold. Oracle offer the complete solution. You get full expert consultancy providing you with the fastest best value solution. Easy to understand asbestos reports with appropriate recommendations and solutions to whatever is discovered. You get our team of fully HSE licensed asbestos remediation experts to carry out whatever remediation is required. We will even provide you with the required asbestos air monitoring as and when you need it.